Dare: Can I DIY Fashion Week? No more whiny complaints about Fashion Week's avante-garde looks. This is my attempt to stop saying, "It's gorg, but I could never do that!" It happens to me every Fashion Week: I become slightly (OK, totally) obsessed with all of the shows online. I can’t get enough of the stuff. I scroll through pictures of models with flawless makeup and elaborate hairstyles all the livelong day. By the end of the week, I’ve got a major case of “laptop screen eyes.” Not cute. As much as I love all the New York Fashion Week trends, I don’t even attempt to try the looks myself because I know I’ll just be disappointed. It’ll be like that one time I tried to make lemon meringue pie from Martha Stewart’s cookbook, and it ended up looking like a sad mound of Jell-O. I don’t want to look like sad Jell-O. So I don’t even try. But, the other day, as I was looking at an ah-mazing photo of a fishtail braid hairstyle from the Christian Siriano show, I couldn’t even get the whiny words out of my mouth before Tiffanie, our editorial assistant, put me in my place. “Um, you can definitely do that,” she insisted. “You think?” I asked, completely skeptical. It was on. Tiffanie challenged me to a Fashion Week DIY duel and I was totally game. Maybe I actually could look good in some of these runway styles. We enlisted the help of some other editors and decided to recreate our four favorite looks from Fashion Week. 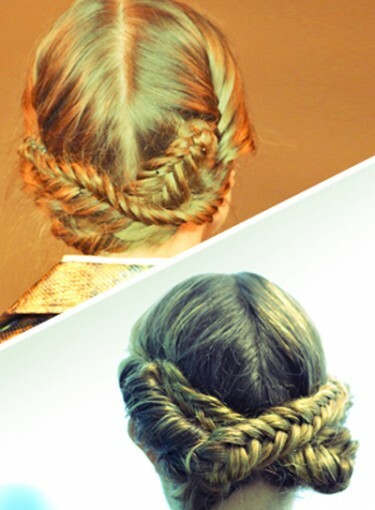 And yes, one of them is the Christian Siriano fishtail braid. Did we succeed? Or was our DIY Fashion Week Challenge another lemon meringue pie disaster? Keep clicking to find out.